In 1961, Troy, Alabama was the quintessential small southern town with Troy State College situated just two miles south of a quaint town square. For years before, the College served as the training ground for teachers in and around south Alabama’s “wiregrass,” the name given to the geographic area of flat grasslands that stretch south from the panhandle of Florida and north to just above Montgomery, where small family farms grew crops like cotton, tomatoes, and peanuts by the plenty. Times were changing in Troy (just like all across the country). The school was small, only about 1800 students, but slowly growing. The College had begun offering master degrees and marketing itself to a wider population. Despite its efforts to grow, student life did not reflect the scene of what a vibrant college campus in the south should look like. A large majority of the students commuted to and from neighboring towns daily and most of the dorm students went home on the weekends. There was no social life on the campus. Several students had experienced the fraternity life and held personal wishes for creating one at Troy; however, they were not connected. One such student, Johnny Butler, a sophomore from Andalusia had visited the Omicron Chapter of Pi Kappa Phi, at the University of the Alabama on many occasions and had been offered a pledge pin on condition he transfer to the University of Alabama. Johnny did not transfer but became determined to see fraternities and sororities on the Troy campus. Instead he ran for and was elected the SGA president in the spring of 1963. He ran on a pledge to bring big name Entertainment and the Greek system to the campus. He could only deliver one of these promises. As a local DJ he made contact with a talent agency and during the year brought The Lettermen, the Four Freshman and Journeymen, later known as the Momma’s and Poppa’s to Troy. His efforts to bring fraternities failed as the Student Senate voted down his proposal to allow fraternities and sororities to form on campus. The effort, however, proved to be productive as it brought together the men who would eventually be successful in organizing the Gamma Gamma Chapter of Pi Kappa Phi. 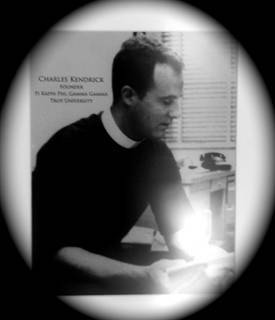 In early Fall of 1963, Butler was sitting on a bar stool at the Pine Lounge in the Troy Hotel when another young man sat down beside him and introduced himself as Charles Kendrick, a Pi Kappa Phi transfer from University of Georgia. Together they pledged to do whatever was required to bring Greek life on campus. Kendrick related that Terry Butts, a member of Pi Kappa Phi, Omicron Chapter, and Ron Taylor, a pledge from Omicron; both were transfer students to Troy. Within days, contact was made with Butts and Taylor who readily agreed to help. Kendrick and Butler immediately brought Bill McCartney, a US Navy veteran from Ft. Walton Beach, FL. into the leadership of their movement. Thereafter these three: Kendrick, Butler and McCartney selected and recruited 24 men who would compose the colony of Pi Kappa Phi. Thereafter, weekend parties were held at the party room at the Pine Lounge, where members exchanged ideas over 15 cent beer served to the men, most of whom were underage, by the “Boss Man” Ralph Waldo Emerson, yes, just like the Poet. With the assistance of Butts, Taylor, and the first Faculty Advisor, Mr. Robert O Arrington, a Business Professor in the Troy State School of Business, things began to happen. Young women were eagerly accepting the invitation to attend these parties. Quickly the men began to consider themselves a brotherhood and started to brazenly refer to themselves as a fraternity even though they were not officially sanctioned by any national organization, nor were they recognized by Troy State as a student organization. These men first made their appearance on campus at “The Lettermen” concert on February 10, 1964. The other students knew that something was different. These men were the concert ushers, which meant their friends, and dates were the only ones getting access to front row seating. This continued to be the case for future events on campus that year, which drew the envy of some and the ire of others. Just who were these guys? Who were these men adorned in khaki and blue bearing homemade symbols of a Greek organization? It mattered not to these men that other students may be jealous of their actions because one thing was certain — the ladies of Troy State College loved every bit of it. As of February 1964 the men had assembled a core group of the most popular, scholarly, and athletic men on campus. Though widely recognized by the students as a fraternity, they needed to make their presence official. After The Letterman concert Charles and Johnny got an appointment with then College President, Dr. Frank Stewart to seek permission to invite Pi Kappa Phi national fraternity on campus. He was cordial but explained that fraternities and sororities were “out of the question.” This was a small school with students from small towns and parents would most certainly object to the likely shenanigans of a fraternity on campus. He refused to take a vote to the Board of Trustees or the faculty. Shortly after this most disappointing meeting, on March 21, 1964 Dr. Stewart died tragically of a heart attack. The men showed class by assigning their ranks to maintain a wake at the head and foot of the casket at the President’s House for two straight days and nights. Faculty and student alike began to notice that there was more to fraternity than access to front row seats at concerts or 15 cent discount beer at the local tavern. On October 1, 1964, Colonel Ralph Adams, a retired Air Force Jag Officer and attorney, was appointed by the Governor as President of Troy State College. That same month Charles and Johnny approached the new President about the idea of fraternity, and this time there was SUCCESS!! President Adams agreed that if the student body voted to approve fraternities and sororities on campus, then the administration would “fall in line” and invite Greeks to Troy State. With the assistance of Miss Gail Franklin, the ringleader fighting to bring sororities to Troy State and, interestingly, the future bride of Charles Kendrick, students began to organize for the big election. After many long days and nights of campaigning, their dream came true. The election was purposely set for a Friday afternoon and the resolution to accept the Greek system passed by a very slight majority. Troy was now GREEK! Official rules still had to be worked out with the Administration. That same Friday night after the results were published, these future men of Gamma Gamma, along with their lady guests, celebrated late into the night at the Pine Lounge with the Boss Man serving 15-cent beer. Approximately one month later, Durwood Owens, Director of the national office of Pi Kappa Phi came to Troy. He was informed of the efforts made to colonize a chapter and was invited to sanction the group. Mr. Owens presented each of the brothers a copy of a small book bound in blue with the symbols of his fraternity emblazoned in gold across the cover. Contained in it was the history of the organization, including the story of a group of men who, in 1904, worked against the odds at the College of Charleston to form what would later become Pi Kappa Phi. Mr. Owens told the men to study to book, explained the expectations of the colony, and informed them of what would be required to become a chartered chapter. Terry and Charles, already initiated members of Pi Kappa Phi, were appointed to initiate the colony. 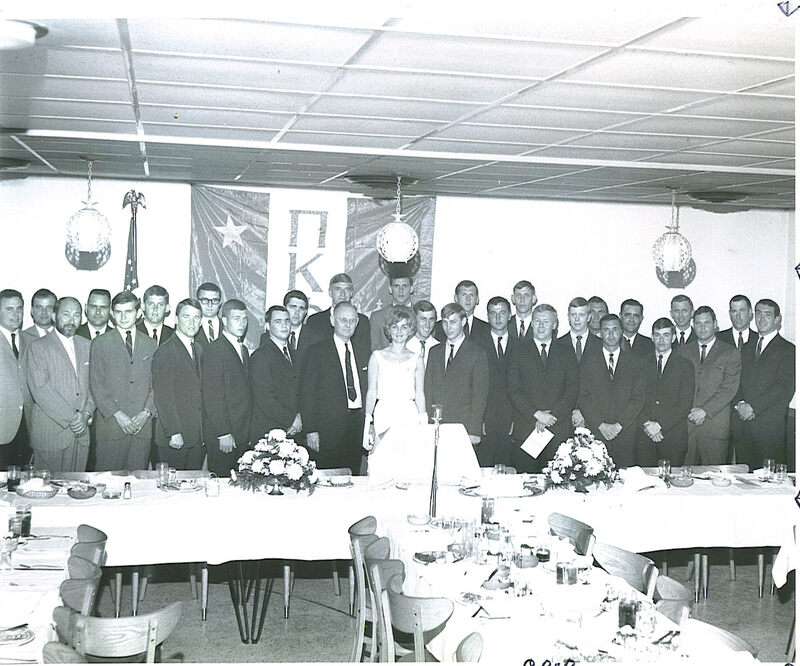 On December 6, 1964, at the Pine Lounge, twenty-four men were inducted (by Cermonial Ritual) into the Kappa Phi Colony of Pi Kappa Phi, Troy State College and Pi Kappa Phi was finally established at TSC. Each were presented with a diamond shaped jade pen inscribed with a gold star and lamp scrolled across the front. The College soon followed with its endorsement of the fraternity, and the colony received its full charter on April 4, 1966 designating it officially as the Gamma Gamma Chapter of Pi Kappa Phi. Though it was now official that these young students were men of Pi Kappa Phi, many of the initiates were called into military service after graduation in May 1965 and were not able to be fully initiated into the Gamma Gamma Chapter in 1966 during the Chartering Ceremony. This was remedied on August 11, 2010 when the colony brothers met at the house, now located at Troy’s newly built fraternity village, and were initiated into the chapter. After being initiated, the colony brothers presented the active chapter with a Pi Kappa Phi flag that flies high above the house located at the center and most prominent location of the fraternity village today along with a huge ceremonial bell that is used today and will carry the traditions of the Colony for years to come. It should be noted that this history is credited to several members of the colony who have been interviewed in recent years. Those interviewed unanimously felt that full recognition was warranted for Charles Kendrick as the Founder of Gamma Gamma. Charles brought the leadership, knowledge, and motivation necessary to make the creation of Pi Kappa Phi and the Greek system a reality. Without his leadership, Troy State (now Troy University) may never have had a Greek system. Dr. Charles Kendrick, PhD., Demorest, Georgia, entered the chapter eternal a happy and well-honored member of our fraternity on December 10, 2010. His legacy lives on in the over 1,000 current members of Gamma Gamma Chapter, Pi Kappa Phi and may his legacy live on in the next 1,000 brothers to find their home away from home. In the month’s following the colonization, Charles Kendrick connected with several alumni to assist the colony on the path to chartering, Dr Doug Hawkins, Brooks Thompson and Dr. Carl Schaumburg. Dr. Doug Hawkins was appointed as the first Chapter Advisor of the colony and the Gamma Gamma Chapter. Dr. Hawkins was instrumental in guiding the original colony and the Greek system through the formative years at Troy State College. Likewise, Faculty Advisors Dr. Brooks Thompson and Dr. Carl Schaumburg were invaluable to the men of the colony and it’s new members on the road to becoming the Gamma Gamma Chapter of Pi Kappa Phi, which was chartered on April 9, 1966. In particular, Dr. Hawkins and Brooks Thompson provided the leadership and support to meet the National Headquarters chartering requirements and continued to lead the chapter for years to come. Their photo’s can be seen hanging in the house today and will remain as a sign of the significant roles that both men played in the success of the Gamma Gamma Chapter. The chapter will be forever in their debt for their loyalty and dedication to the chapter. The National Representatives and guest speakers during the Chartering Banquet included: Durwood Owen – PKP CEO, Charles Tom Henderson – National Treasurer, Former National Chancellor – Frank Hawthorne and Ralph W. Adams – Troy State President. 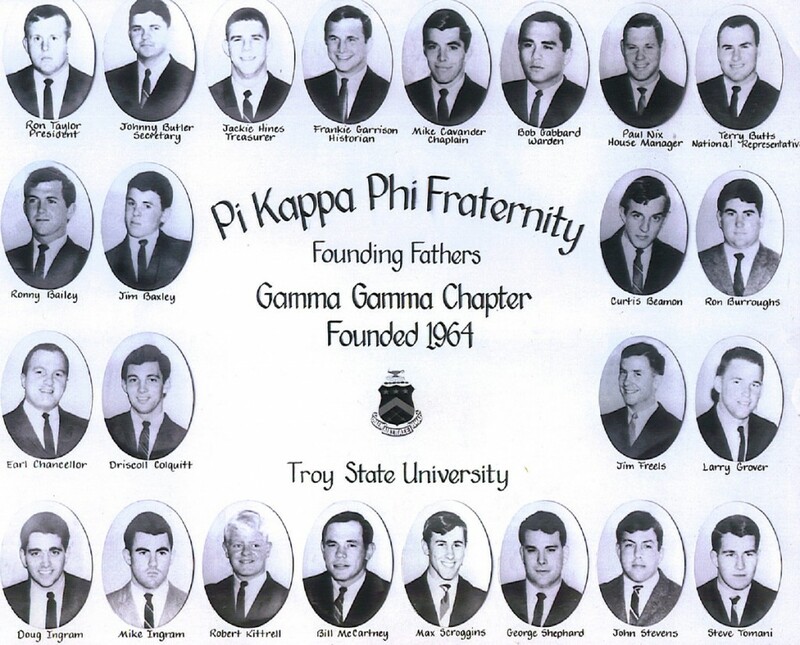 It should be noted that in conjunction with the chartering weekend on April 9, 1966, several National Representatives met at Troy and formed what is now, Pi Kappa Phi Properties. In addition, Pi Kappa Phi Properties purchased the very first fraternity house under the name of PKP Properties on North Three Notch St which soon became the home of the Gamma Gamma Chapter of Pi Kappa Phi. Gamma Gamma Chapter has historical significance at the National level as being the birthplace for Pi Kappa Phi Properties and we are proud of all the men that chartered the Gamma Gamma Chapter of Pi Kappa Phi. (Please continue to check back as we continue our historic document verification to bring the most accurate information possible to you on the history of Gamma Gamma from the point of Colonization until being chartered as the Gamma Gamma Chapter on Apr 9, 1966).